One day I was all alone in my home with my husband travelling and my kids at their friends' homes for a sleepover. I had 15 minutes before my favourite tv programme started , a very hungry stomach and nothing but 2 Japanese eggplants, 15 lady fingers, an onion and half a tomato. All stock in my refrigerator had depleted. I set my kitchen timer at 14 minutes...well, one minute grace period just in case I needed it. I finished it in 13 minutes flat. By the end of 15 minutes I was sitting in front of my tv grinning ear to ear and ready to attack my food. Though this preparation is good enough for 4 persons I ate it all by myself. 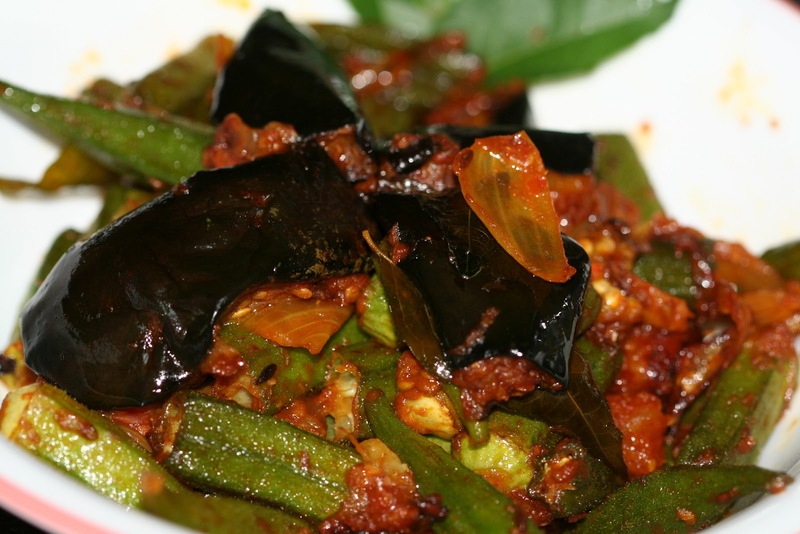 Though I know some who don't like Okra because of the seeds and remove them painfully out of every little piece of the vegetable, it is loved by most Indian adults and children. Low in calories, contains no saturated fats, is a rich source of dietary fiber, vitamins C, K, A , vitamin B-complex group, minerals and many other nutrients. The slimy substance in the vegetable helps in smooth peristalsis of the digested food and helps in relieving constipation. I have met numerous people who dislike eggplant. Some say it does not have any nutrients so why go through the trouble of cooking and eating it, they believe it is the name beygun which means without any good. And many such reasons for not eating it. Some don't eat it because their friends don't eat it.The best one though was 'it is like fish growing on a plant'. I would like to dispel such beliefs. Eggplants are a good source of Vitamin K, Vitamin B6, Potassium, Manganese, Folic acid, dietary fiber and is low in cholesterol. And are extremely tasty. I would eat them even if it didn't have any nutritive value. It is amazing how this vegetable has it's origins in India and has travelled all the way to Italy and is now a staple vegetable there and in the entire Mediterranean Region. This one I promise will become part of your bi-weekly menu right away and then move in on the weekly menu and soon will be in the list of your comfort foods just as it is in mine. .Heat oil for frying (blanching in hot oil)* in a wok. .Meanwhile trim and cut the eggplant into a vertical 1/2 and then into 1 1/2 inch thick slices breadthwise. .Trim the tops off the okra (optional) and cut into 1/2. after 1 minute and fry on the cut side for 1 minute. Remove and set aside on an absorbent kitchen towel. .Heat 1 tsp. oil in a skillet. .Add onions thinly sliced and a little salt. Saute till light pink. .Add coriander powder, red chili powder, turmeric powder and a little salt. .Add the chopped tomato and tomato puree. Mix well. .Add 2 Tbsp. of water and mix well. .Add the fried eggplant and okra. .Mix gently till all vegetables are coated with the gravy. .Check for salt. Add more if required and mix gently. .Cook on a slow fire for 5 to 6 minutes. .Serve hot with Rice or Chapatis. Note: *Blanching in hot oil seals the flavour of the vegetables as well as their colour. *Japanese eggplants are deep purple in colour and small in size and look very similar to the Holland eggplant. Sounds like a very do-able recipe for me. Will be trying it out one of these days for sure. Thx a ton Tanuf. I am so happy you tried it and liked it. Thx CL. do let me know if you liked it and if the recipe was easy to follow. I will be making this recipe for my in-laws who love both Eggplants n Okra. Please suggest which brand of tomato puree is preferable? You can use any tomato purée available in the market, though I prefer to use duChef. Lucky me, I got the chance to relish the chef's version. Yummy, I tell you ! Thank you so much for trying out this recipe. Hope you like the other recipes too.